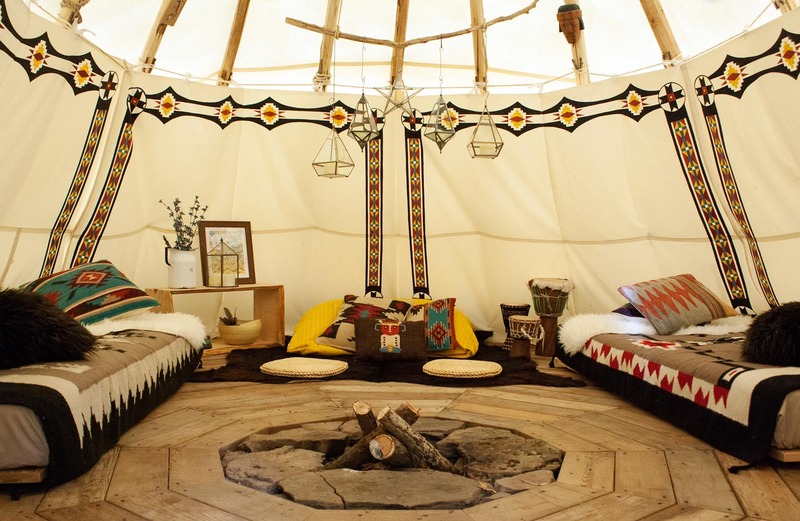 $15/night per additional guest after 2 guests (up to 4 guests per tipi). Groups/Events are not hosted at this property. All canceled reservations received 16 or more days prior to arrival are subject to a 10% cancellation penalty of the entire stay and will receive a 90% refund. Cancellations within 48 hours of booking will receive a full refund. The Bellfire Tipi is a comfortable and unique getaway located in Meeker Hollow on 10 acres of land. This perfectly private and tranquil property borders both state land and miles of lush, green forest. Custom made furniture, wool carpets, cedar floors and handmade decor pieces have been selected and curated to create a space that is meditative, relaxing and practical. There's no doubt that the Sioux Indian created an incredible structure that served as their home year round. The owners were inspired by their creativity and innovation and took it up a notch to create a space that serves the modern needs as well. There is a solar battery charger that can be used to charge your devices, a small gas stove for cooking, ceramic coffee dripper and of course, no camping trip is complete without the s’more skewers. The small kitchenette also includes mugs, plates and silverware. There is undeniable magic in sitting around a bonfire inside a tipi and listening to the running, nearby stream or waking up to the sounds of the wind and birds singing. Open May 1 - October. Best time to visit, Late Spring / Summer / Early Fall. The Bellfire Tipi is an 18ft dream and perfect place for a comfortable and unique getaway. There is a solar battery charger that can be used to charge your devices, a small gas stove for cooking, ceramic coffee dripper and of course, no camping trip is complete without the smore skewers. The small kitchenette includes mugs, plates and silverware. There is a stone firepit inside the tipi and a stone firepit outside with seating area and coal grill. The outhouse was designed and built by the owners with reclaimed barn wood and cedar roofing. It features a compostable toilet and wash station and is located about 50 feet from the tipi. What to bring: hiking boots, long sleeve shirts (even in the summer), bug spray, and flashlights.